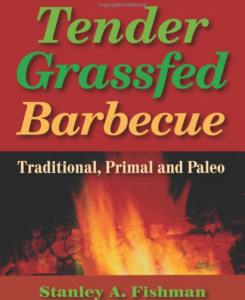 It’s been just over two years since I first started using Mr. Fishman’s previous book, Tender Grassfed Meat. I still use it all the time and every recipe I have tried has been wonderful. To me this shows an author who truly tests their recipes and takes the best ones for their book. I was so excited to get this new book and see what new recipes there were to try. Cooking grassfed meat is very different then cooking corn fed meat. It’s much better for us and for the animals and the taste is truly wonderful, but learning to cook it can be challenging at first. Once you learn the methods it’s easy but you do need to learn the differences. This book is broken into three sections. The first section is an overview of the benefits of traditional foods and traditional barbecue methods. There have been article about how it’s unhealthy to barbecue meat, and this book gives you how to barbecue healthfully, using real food ingredients. In the second section there’s a great section on barbecue cookers, equipment and fuel – I learned a lot from this one. How to use indirecting cooking and traditional barbecue flavors and ingredients. There’s also a section on types of grassfed and pastured meat, how to prepare and finding and using grassfed and healthy fats. The third and largest section is the recipes and there are a lot. Recipes for broth, Beef, Bison, Lamb and Pork. Also a section on Baste, Raw Vegetable Condiments and two sections on side dishes, one of them specifically for low carb side dishes. I’ve made a few recipes so far, the Shashlik Shoulder Roast, Basil Lamb burgers and the Chimichurri Sauce. They were all delicious and there are many more recipes I plan to try. This book is great for everyone who wants to barbecue healthfully. If you are eating Low carb, Paleo, Primal/ Real Food it’ll give you many, new healthful recipes for you and your family. Highly recommended! Thanks for linking your great post to FAT TUESDAY. This was very interesting! I’ll be interviewing Stanley Fishman about this book! Hope to see you next week!